With their Tampa Bay Lightning jerseys casually slung over-shoulder like so many yachtsman’s sweaters, a good number of the fans ambling toward Amalie Arena last night seemed far too chill to be attending a Game 7. But really, it was just a practical consideration: The Florida evening was sunny and humid, and these locals knew far better than to don such a heavy garment before they’d reached their destination. Still, if they were nervous, you couldn’t see it — any trepidation in their eyes was well hidden behind their sunglasses. So was the team exhibiting a “quiet confidence,” a reporter asked Jon Cooper? The second-year head coach declined to go there. “I’ll answer that question after the game,” he demurred. For the first 40-plus minutes of the game, however, almost nothing about the Lightning seemed confident, quietly or otherwise. Two minutes in, the Red Wings had already gotten off a flurry of six shots on goal, while Tampa Bay managed an icing penalty and a giveaway. With six minutes to play in the first, a Lightning power play went nowhere, and got there weirdly. (It wasn’t the only subpar performance by special teams: Throughout the evening, Tampa Bay’s extra-man unit often resembled a bunch of kids playing hot potato.) A botched scoring chance with about a minute left before the first intermission left the majority of Tampa Bay fans doing the Surrender Cobra, hands atop frustrated heads. The second period was more — much more — of the same. The most promising thing that could be said about the Lightning after 40 minutes was that the score was somehow still tied nil-nil. “There’s a deli called Schwartz’s in Montreal that I’m dying to get a sandwich from,” said Red Wings head coach Mike Babcock on Wednesday morning, his way of expressing the hope that Detroit would move on to play the Canadiens in the second round. Babcock’s pregame press conference was short, and mostly stifled: He declined more than once to answer questions about the topic du jour, the one-game suspension of stalwart Detroit defenseman Niklas Kronwall for a hit on Nikita Kucherov in Game 6. “I think if I [just] talk about Game 7, I won’t get fined,” Babcock said the first time he was asked for his opinion on the decision. “If I talk about Game 7, I’ll still have all the money I have,” he repeated when asked again. With his craggy features and godly head of hair, Babcock somehow resembles both the hero and the villain of a Marvel or DC comic book. His place within the broader narrative of the Red Wings’ playoff run has been similarly two-sided: On the one hand, he’s presided over a team that hasn’t missed the postseason once during his decadelong tenure,1 and he’s won a Stanley Cup. Over the years, he’s grown into something of a Detroit institution. On the other, it’s no secret that this is probably his last season in the Motor City. Trying to guess what will come of his pending free agency has become as much of a parlor game in the hockey world as it would for any marquee player. The coaching carousel has all but ground to a halt these past few weeks; no team seems to want to make a move until they know what Babcock’s doing. The only thing that was unclear was whether this would be his last game — or if he’d get to sample that famous smoked-meat sandwich. It had been a frustrating few weeks for Stamkos, who finished second in the league in regular-season goal scoring but had added zero throughout the first round. But the playoffs are about team depth; with teams focusing on shutting down star power, it’s so often the largely unheralded players who make the difference. Nearly four minutes into the third period, Braydon Coburn, at the point, one-timed a feed from below the goal line by Ryan Callahan. 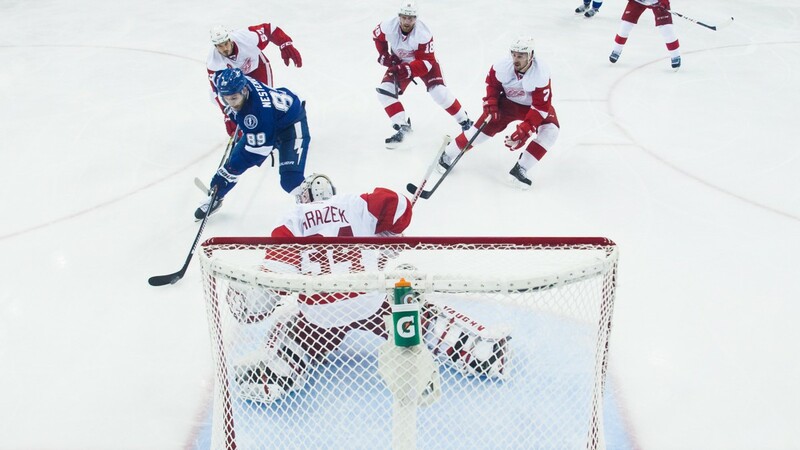 The shot was perfect: top corner, bingo-bango, so quick that Red Wings goalie Petr Mrazek never saw it. It was also kinda accidental, Coburn later admitted. “The puck flipped up on me and knuckleballed in there,” he said. Coburn joined the Lightning from the Philadelphia Flyers in March, one of a few additions to the team this season who made the difference last night. Another was defenseman Anton Stralman, whom the New York Rangers annoyingly let walk after last year and who was promptly snapped up by Tampa Bay. But the Lightning had new life. It was like the pressure had been lifted, like they finally believed they deserved to win. The clock ticked down in the slowest of motion, and Tampa Bay continued to press. Finally, Detroit had the opportunity to pull Mrazek for an extra skater. 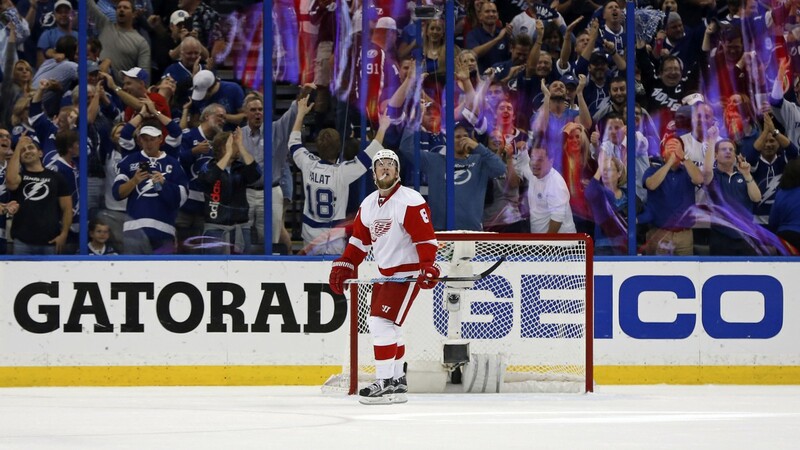 Almost as soon as it did, Stralman cleared a puck from deep within his defensive zone that went off the boards, past a couple of Red Wings, and slowly, ever so slowly, into the net. Where Cooper was affable and loose — “Don’t take offense,” he said as he stepped to the podium in front of a crowded room of cameras and sports writers, “but it smells really bad in here” — Babcock projected an air of finality. He pointed out that his team is “not as good as it was; it’s very evident.” He noted that, while the Red Wings have some promising young athletes, his “best players [will be] 34, 35, 37” — meaning Kronwall, Henrik Zetterberg (who, like Stamkos, was held to zero goals in the series), and Pavel Datsyuk. When he was asked about what the future held for him, he replied that he wasn’t going to talk about that now. “We’ll have a meeting and final press conference,” he said. “I’ll be happy to talk about that crap then.” While he probably won’t be eating a sando from Schwartz’s any time soon, there’s no question he’ll be wined and dined by franchises all over North America before too long. Last season, with Stamkos still feeling the effects of a broken tibia and Bishop out with a dislocated elbow, the Lightning were swept in the first round by Montreal. But there’s reason to believe that this time around things will play out differently. Tampa Bay survived this year’s Detroit series with zero goal scoring from Stamkos, an aberration that’s unlikely to continue. And Bishop, in net, overcame some tough play in the early playoffs and turned in a solid shutout when it mattered most. The Lightning very nearly stumbled, but instead they found their stride. It’s not too difficult to imagine it becoming an all-out strut. Nor in the decade and change before that. Cooper pointed out on Wednesday night that “you can’t take for granted that you’re just going to make the playoffs,” and then interrupted himself. “Well, Detroit can,” he said.